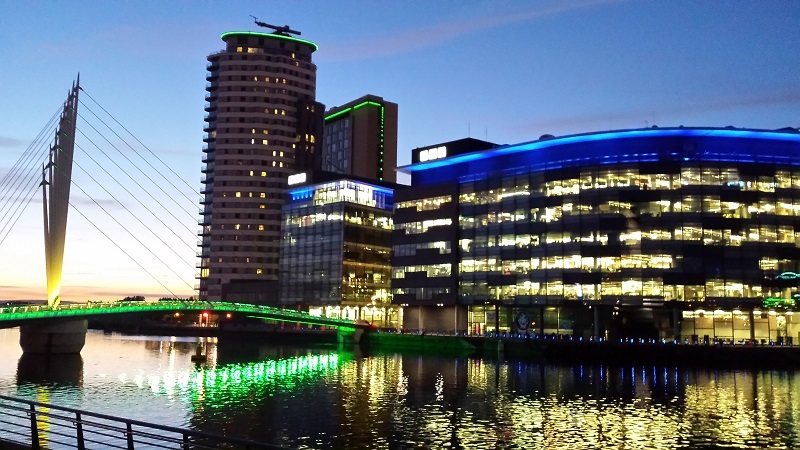 Today Jisc is launching the Code of Practice for Learning Analytics at the UCISA Spotlight on Digital Capabilities event here in the amazing MediaCityUK at Salford Quays. Developing this document was chosen by institutions as the number one priority for Jisc’s learning analytics programme. The Code aims to help universities and colleges develop strategies for dealing with the various ethical and legal issues that may arise when deploying learning analytics. 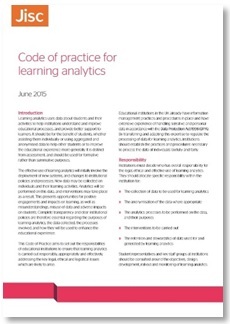 The Code was developed in the UK context and refers to the Data Protection Act 1998 however most of it is relevant to institutions wishing to carry out learning analytics anywhere, particularly in other European countries which have similar data protection legislation. It can be adopted wholesale or used as a prompt or checklist for institutions wishing to develop their own learning analytics policies and processes. If you find the document helpful or feel that anything is unclear or missing please let us know. Keeping it concise was thought to be important but that meant leaving out more in-depth coverage of the issues. Over the coming months we’ll be developing an associated website with advice, guidance and case studies for institutions which wish to use the Code. The process has been overseen by a Steering Group consisting of Paul Bailey (Jisc), Sarah Broxton (Huddersfield University), Andrew Checkley (Croydon College), Andrew Cormack (Jisc), Ruth Drysdale (Jisc), Melanie King (Loughborough University), Rob Farrow (Open University), Andrew Meikle (Lancaster University), David Morris (National Union of Students), Anne-Marie Scott (Edinburgh University), Steven Singer (Jisc), Sharon Slade (Open University), Rupert Ward (Huddersfield University) and Shan Wareing (London South Bank University). Helen Beetham (Higher Education Consultant), Terese Bird (University of Leicester), Crispin Bloomfield (Durham University), Alison Braddock (Swansea University), Annemarie Cancienne (City University London), Scott Court (HEFCE), Mike Day (Nottingham Trent University), Roger Emery (Southampton Solent University), Susan Graham (Edinburgh University), Elaine Grant (Strathclyde University), Yaz El Hakim (Instructure), Martin Hawksey (with other members, Association for Learning Technology), Ross Hudson (HEFCE), John Kelly (Jisc), Daniel Kidd (Higher Education Statistics Agency), Jason Miles-Campbell (Jisc), George Munroe (Jisc), Jean Mutton (Derby University), Richard Puttock (HEFCE), Katie Rakow (University of Essex), Mike Sharkey (Blue Canary), Sophie Stalla-Bourdillon (Southampton University), Sarah Stock (University of Essex) and Sally Turnbull (University of Central Lancashire). Finally, many thanks to Jo Wheatley for coordinating the production of the print and HTML versions of the Code. Thanks for this it will be very useful! Should there be 8 areas? “Transparency and consent” is an area outlined in the code of practice, but nowhere is it mentioned in this post. David, thanks for pointing this out. Post updated accordingly.